I’ve been to two other Gwynne Dyer lectures at the U of R, and each time they are very interesting presentations of what has happened in the world. There is also a little predicting going on, so if you’re curious what could happen, settle in, and listen to it all. How do you distribute abundance fairly? First we have to deal with shitstorm from Donald Trump. Mind you, the fact there’s legal action in the cards hasn’t stopped SaskPower from awarding the firm a $4 million portion of the $45-million Island Falls Powerhouse Concrete Rehabilitation project. It goes on to note “very poor to no support from SNC Lavalin,” and “serious design deficiencies” in the project. Associate professor of marketing at the University of Regina, Lisa Watson, says “of course people are going to be upset” over the issues at Boundary Dam. The bigger question, she says, is whether they should be. The consumer push for more environmentally sustainable options and clean energy is a “major change” for government, she says, and perhaps people shouldn’t be upset when projects involving groundbreaking technology don’t go as planned. Some premiers are sitting out today’s climate change summit in Quebec City, but Saskatchewan Premier Brad Wall is there, talking up the province’s efforts to capture and store carbon dioxide. Wall told an audience that the world needs to follow Saskatchewan’s example if there are to be serious reductions in greenhouse emissions. 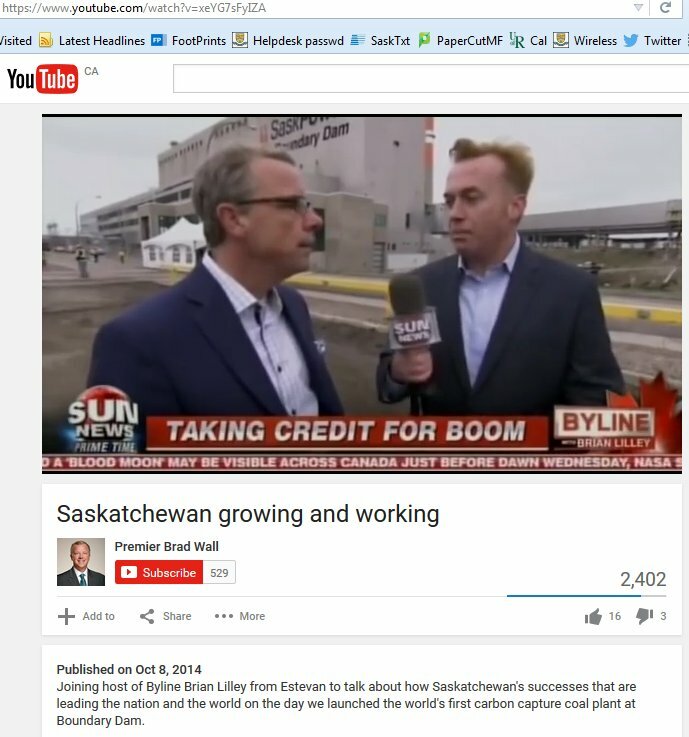 I tried to find Brad Wall on a rooftop shouting to people about it, instead there is video of him on Sun News TV boasting about it to Brian Lilley, and more than a smattering of articles on the Web boasting about it. On the other hand, he thinks taxpayers “would rather have SaskPower delivering power to them,” rather than the private power companies that operate in other jurisdictions. Holy spinning neckties Batman! Our loss of confidence is with Bill Boyd and those politicians that chose carbon sequestration over renewable energies. The Sask Party keeps green washing this sequestration turd as if we asked for it in the first place. Want to restore our confidence? Lets go 40% wind and solar by 2020. But on the other hand, maybe tax payers should waste their money on subsidizing the petroleum oligarchy. Oh and ‘groundbreaking’ here is a pun, nothing more. There’s also the huge matter of SNC-Lavalin’s criminal charges. The Federal government stopped dealing with HP after a bribery conviction for that company. More from Global News Regina. It was a real dog’s breakfast at this one, where everything from polls to strategic voting discussed frankly by 3 political experts from Regina. Actually it wasn’t a complete mess, it was a well organized event, but the dog’s breakfast thing will make sense if you watch it all. @MMandryk opening in #URPAIS panel "I hate polls!" "And why you guys should hate them too & why they are not good for a democratic society." I was impressed to learn that France had made new commercial buildings do this. 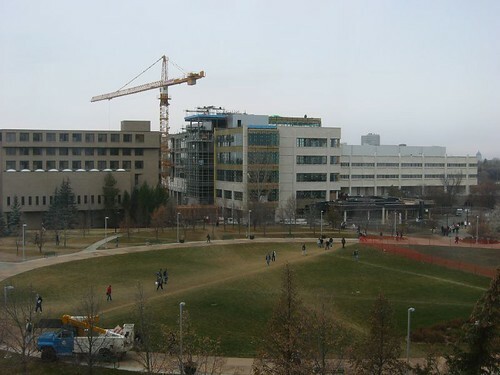 I’ve felt badly that new buildings going up all over the University of Regina campus since I started paying attention to it in 1998, haven’t put a single solar panel up on them. There’s a building on Research Dr. with a round skylight that looks like a CD player, that would have been a perfect spot for some solar panels. At least the RIC building in 2006 had a partial green roof built onto its shady side. The Calder case about the Niska people. Argued no treaty so they had Aboriginal title to the BC land. Crown: settlement extinguished title. Millions lived in North America hundreds of years ago, but settlers viewed it as empty. By 1867, only 150000 indigenous people remained alive in Canada. Our country must face and address tough issues at all levels of government. Largest Aboriginal population is in Toronto says Bob Rae. Dynamic in the country is changing. Assimilation and powerlessness have failed. A process of negotiation must be used to replace the current structure of power Ottawa has over Aboriginals. "Mr. Harper has done the minimum" "do as little as possible" "want people to leave reserves." #Rae People won't leave the land. Dr. Shiva gave an interesting talk about how system we’ve built are being used to manipulate individuals in societies all around the world into valuing money over life. #BigData contributes to information obesity. – Dr. Shiva #earthdemocracy. Canada thinks it can bomb #ISIS and not create extremism.